If your social media goal is to blow your buds’ minds at the places you’ve gone, don’t settle for recording that epic vista via GoPro or (gasp) your iPhone. 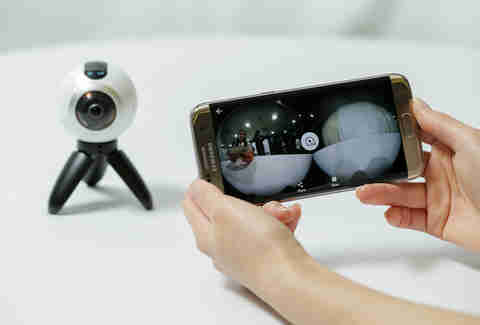 To inspire true fits of jealous rage among your friends, capture your most far-out scenes in immersive 360 panoramas, via the compact Samsung Gear 360 camera. The Gear 360 uses two lenses (front and rear) to capture the full scene around you, even if it’s in low light, thanks to wide f2.0 apertures. And once you’ve completed a shot, it hogs very little space in your pack -- it’s less than three inches in diameter. For easy editing on the back end, you’ll need to pair it with a Samsung Galaxy S7 or S7 Edge smartphone. 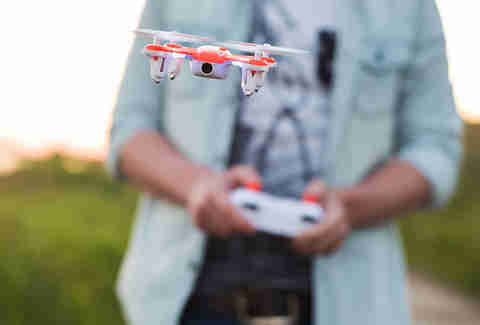 Capturing dramatic overhead footage of your solo ascent of the sledding hill in your local park needn’t require hauling a backpack-hogging drone. 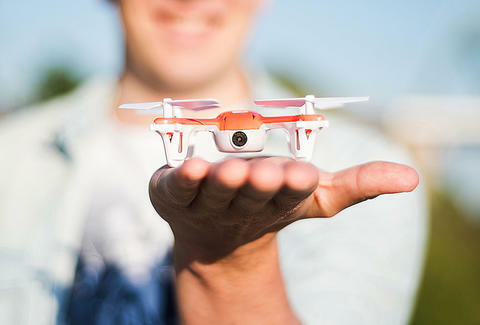 The SKEYE Mini Drone is a full-fledged flyer utilizing four propellers and six-axis stabilization to remain steady up to 50 meters away from you at the gamepad-like controls. It can take flight for as long as eight minutes, time for so many banked turns and barrel rolls that you may have to pass out barf bags when showing off the footage afterwards. Snapchatting, Instagramming, and Waze-ing all at once ensures your phone’s battery won’t make it til lunch. So what’s the workaround? Snap one of those bulky battery cases to it and embrace the unsightly bulge in your pockets? No thanks. Instead, pick up the Thino, a compact, aluminum-bodied charger that provides two extra hours of run time for your phone. Even better than its svelte form factor: the fact that Thino boosts your device three times faster than other portable chargers (a chip inside it detects the fastest rate that your device can be charged). While the Thino won’t double your phone’s battery life like bigger chargers, carrying it may prevent you from getting lost while mapping your walk home from that random Sunday hike. It seems like everybody would like to 3D print whatever they want, but who wants to spend a load of loot to do it? Enter the Olo3D, which mini-sizes the 3D printer and shrinks the cost, too, by using your smartphone as its brains. The portable (one pound) device is powered by 4 AA batteries and uses the white light of your phone screen to harden plastic-like resins into whatever 3D shape you desire -- a ring, a keychain, a scale model of yourself as a centaur, A-Rod style… the possibilities are endless. Projecting a movie in your backyard is cool, but how cool is showing a movie in your tent in the middle of the backcountry? That’s the promise of the RIF6, a truly tiny (2”x2”x2”) LED projector that connects to your smartphone or another media player for up to 90 minutes of movie-showing bliss (you can connect an external battery for a longer runtime). Its resolution won’t match your home theater projector’s -- the RIF6 displays 854 x 480 WVGA -- but your home theater projector won’t fit in your backpack, either, so relax and let the film clips roll. While gadgets continue to miniaturize, some fitness trackers still carry the bulk of an old graphing calculator from trig class. 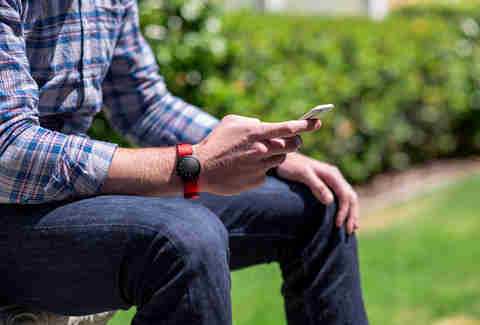 Not the Misfit Shine 2, a tiny (30.5 mm across, 8 mm high), touch capacitive device that links up to a smartphone app and tracks everything from steps to sleep quality, notifying you of progress through 12 LEDs mounted on the dial. Bonus: it’s waterproof to 50 meters. Unless you’re rocking ’90s-era cargo pants, pocket space is at a premium. And while you might love the utility of a bright flashlight on hand at all times, it’s not worth lugging one around on your belt loop. 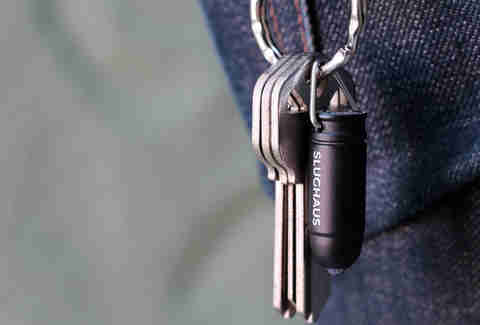 Enter the Slughaus Bullet, the smallest LED flashlight ever made. The Bullet is the size of, well, a bullet (10.5mm x 30mm), and turns on via a simple quarter rotation on the head of its anodized aluminum case, and shines 15 lumens of power wherever you need it. Remember when you thought it was a good idea to wire your den with an 18 speaker surround sound setup only to sacrifice space and trip over the cords? 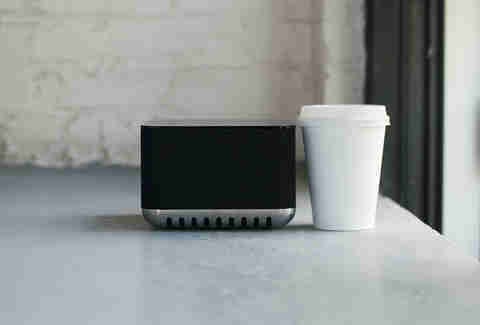 The Core Wireless Speaker System essentially renders your space-hogging stereo setup obsolete. It’s an all-in-one unit that delivers immersive stereo sound and expansive bass from a device that’s barely larger than a hardcover book. Though you may employ it for home theater duty by wiring it to your cable box or Roku, the Core is Bluetooth-capable and links wirelessly to up to eight other Core units in the same house, for whole-home-audio sweetness.